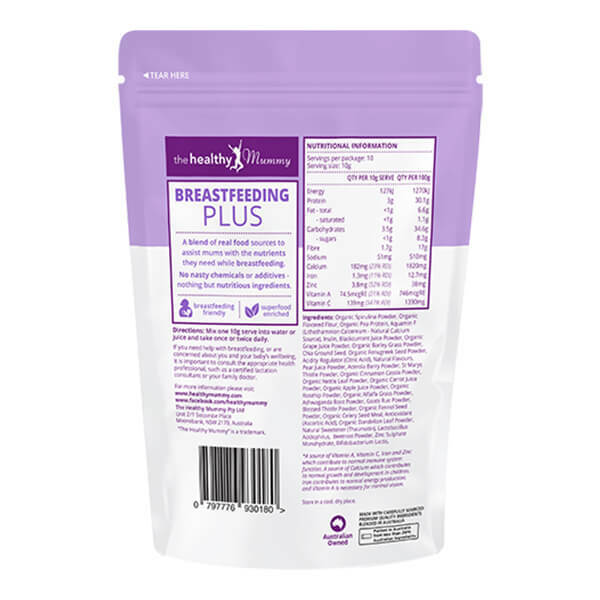 A delicious, nutrient-rich powder filled with vitamins & minerals for breastfeeding mums. 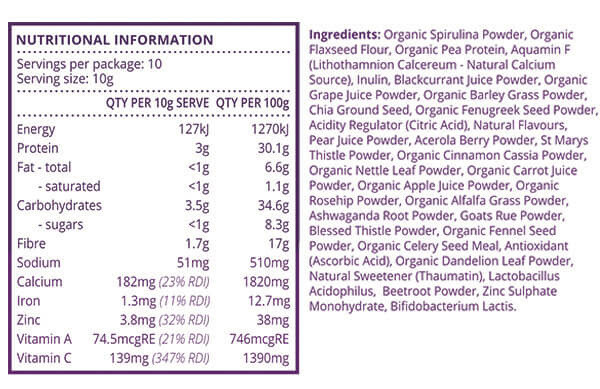 A blend of real food sources to assist mums with the nutrients they need whilst breastfeeding. No nasty chemicals or additives – nothing but nutritious ingredients. If you need help with breastfeeding, or are concerned about you and your baby’s wellbeing, it is important to consult the appropriate health professional, such as a certified lactation consultant or your family doctor. Fenugreek: Is a herb that is well known for its milk boosting properties. St Marys thistle– Also helps with boosting milk supply and is a liver tonic and a potent antioxidant. Flaxseed– Is a good source of fibre and omega-3 fatty acids and when combined with other galactogues helps boost milk supply. Fennel – A sweet liquorice flavoured spice is used to treat digestive and menstrual issues but is also a known to stimulate and increase milk production. It may also pass through the breast milk and help a baby’s digestion and relieve colic symptoms. Goats rue– The dried leaves or the goats rue is considered a galactagogue and studies suggest can stimulate the growth of breast tissue. Pea protein – Is aplant-based, high protein, nutrient-rich ingredient in The Healthy Mummy Breastfeeding Plus. Lithothamnion calcareum: Is from the skeletal remains of the red algae plant. It gathers minerals naturally throughout its life cycles and when harvested, its remains contain calcium, magnesium, iron and several other trace minerals, which are excellent for bone tissue and general health. Spirulina is a natural algae that is very rich in a number of nutrients such as protein, vitamin b, iron and essential amino acids. It boosts immunity and energy, benefiting breastfeeding mothers. Vitamin C – The RDI of Vitamin C for lactating women increases by 45mg. The Healthy Mummy Breastfeeding Plus is jam packed with ingredients high in vitamin C such as Rosehip powder, Acerola berry powder and Ascorbic acid. Lactobacillus Acidophilus and Bifidobacterium Lactis are powerful probiotics that support the digestive and immune system. Research has even suggested that probiotics taken by a mother during breastfeeding may positively influence gut immunity in their infant. Where are the ingredients from / where sourced? We source materials from our approved quality vendors from both Australian suppliers and around the world. Usually sourced from the country that has the most suitable growing conditions for the particular plant. How the ingredients may benefit breast milk production and breastfeeding Mums. Your nutritional requirements change and increase during pregnancy and after the arrival of your baby. Meeting these increased needs through diet alone can be hard to achieve for some as with a new baby to take care of around the clock, eating and drinking right can sometimes fall by the wayside. The Healthy Mummy Breastfeeding PLUS is specially tailored to help meet the nutritional requirements of a breastfeeding mother. The mixture is full of natural energy and milk supply boosting foods to ensure extra energy, immunity and healthy development of your baby. Healthy Mummy Breastfeeding PLUS assists mothers to meet their increase needs for vitamins and minerals when breastfeeding when not receiving them from food sources. It’s also jam-packed with galactagogues which are known substances that increase milk supply for some women.